Go at dawn, go at dusk, it’s open 24/7! Duck and Waffle is situated on the 40th floor of the Heron tower (the third tallest building in the UK). As UK’s highest restaurant, it also boasts a 24 hour opening, offering breakfast, brunch, an all day menu and late night. The floor-to-ceiling windows designed by CetraRuddy architects have been an a major feature to the dining experience, which overlook the Gherkin and the City’s financial district. 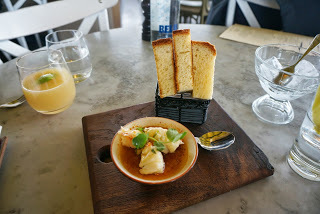 Below is the foie gras crème brûlée is served with butter roasted brioche, and Scottish lobster. This dish, is an absolute beauty. I wasn’t a big fan of foie gras before this, but I loved it. The texture was just right, foie gras creamy, spread over brioche, just melts. 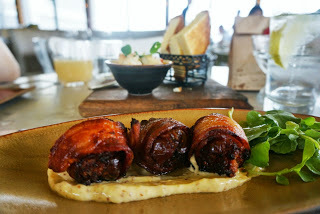 Below we have the bacon wrapped dates which came with linguiça, manchego, watercress salad. Linguiça is smoke cured pork sausage seasoned with garlic and paprika, (Portuguese dish). Manchego is a cheese made in the La Mancha region of Spain from the milk of sheep of the manchega breed, (and yes these are Wikipedia definitions). These were okay, just slightly oily. The creamy cheese were a good addition. Here we have the Duck and Waffle, the Duck and Waffle. This time round I don’t think I liked it as much to be honest. The crispy duck gets smaller and smaller each time I get it.. 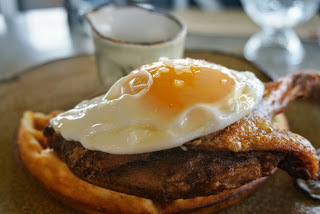 This dish consists of crispy leg confit, fried duck egg and mustard maple syrup. 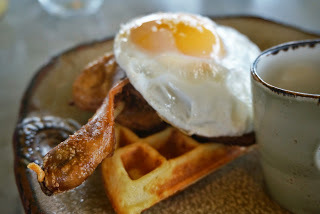 Duck egg is chewier than usual chicken eggs, they’re more elastic, maple syrup and waffle too, were standard. Above and below, by far the best dish hands down. Loved it so much I would probably come here by myself and order just this. 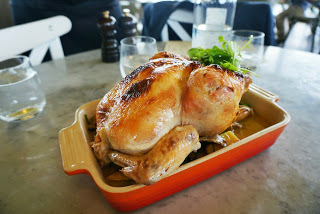 It is a whole chicken with the supplements ratte potatoes, wild mushrooms and truffle. 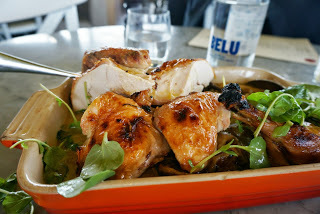 It is a 40 minute wait for them to roast the chicken though, so don’t order this if you don’t have time. It is also for 4 people. Desserts were okay, I couldn’t enjoy it because I was too full from the chicken..
Torrejas (Hungarian dish) comes with maple caramel apples, and cinnamon icecream. Very sweet, verrryy sweet. Service: It’s always been on a good level, there’s a coat rack to take the heavy load off of you, and they serve you with full attention. You do pay 12.5% service charge, and if there is a cancellation 24 hours before a booking you may have to pay a discretionary charge..
Executive and head chefs Daniel Doherty and Tom Cenci were graduates from Michelin star 1 Lombard Street. Booking in advance is recommended, not to mention hard to park near, since it’s bang in the middle of corporate buildings. one of my favorite restaurant in London! !